As many of you are aware, there are forces at work within DGC who steadfastly refuse to acknowledge the clear, coastal management, business and scientific principles as to why a Cruise Ship Terminal (CST) can never be a sustainable tourism infrastructure project for the Gold Coast. And while we acknowledge that the Tourism Industry presently underpins our local economy, it has been extremely frustrating for many in the local community that some within DGC refuse to acknowledge the volumes of scientific research that has been made available to them (and others) by SOSA over the past decade. For example, Tourism Australia research from 2016 found that the main reason international visitors come to Australia is to experience our natural spaces (see image above), yet Destination Gold Coast (ignoring their own research) publicly supports destroying our last remaining natural beach habitat and public open space at the Spit to build a CST – how does that work? 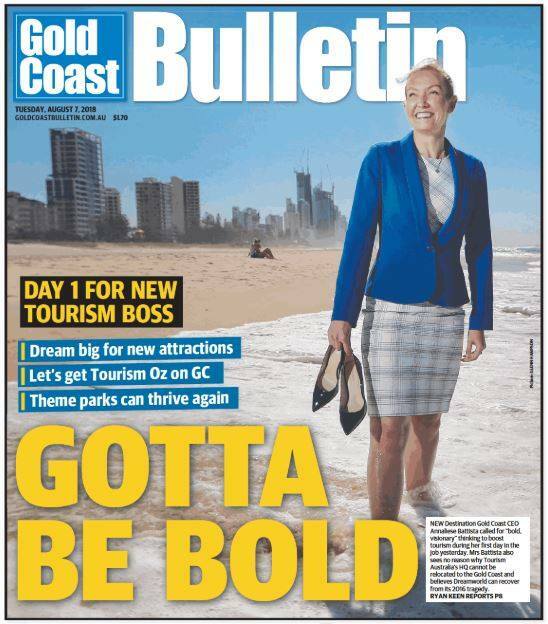 It was heartening to hear Ms Battista describe herself as a "Research Queen" on local radio this morning, and that she looks forward to developing a "strong relationship between the State Government and Destination Gold Coast". Similarly, in the radio interview, Ms Battista stated that all "big-visionary projects must be assessed on their feasibility" and that "cooperation and collaboration with the State Government" will help discover what is best for the community. This is a somewhat novel approach for DGC as they have not only appeared to privately ignore any or all previous scientific research related to the various CST proposals, but have also publicly ignored community sentiment through Destination Gold Coast’s Chairman’s public backing of the Mayor’s Offshore CST proposal. Already, figures within local media have circled the new CEO’s take on the various CST proposals, and quite wisely she has stated that she does not know enough about the projects to comment on them. While some of the dinosaurs remain at DGC, Ms Battista’s first few ventures into the local media have us feeling somewhat relieved and excited, that maybe, just maybe, she could drag that organisation kicking and screaming into this century. As a result SOSA would like to invite Ms Battista to further her knowledge by visiting www.saveourspit.com and explore our extensive online research library. Ms Battista, our door is always open, and if you would like to have a chat about what really goes on in this community space, and what the scientific community have recorded about this and other related tourism projects on the Spit, please give us a call, we’d be only too happy to encourage your "research" habits!